Posted on July 28, 2018 by Michelle M.
This month’s movie is A Stork’s Journey. Richard is a sparrow who is adopted by storks when his mother and father meet an untimely end. When the storks migrate to Africa, they leave Richard behind. With his new friends, Olga the owl and Kiki, the budgie, Richard heads south to rejoin his family. But who cares! It’s all about Kiki! 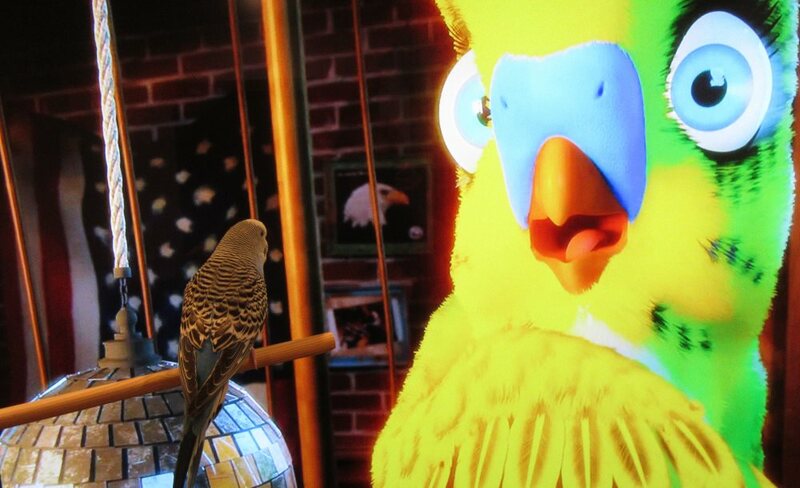 Kiki is a pudgy, disco loving budgie who dreams of becoming a singing sensation at the San Remo music festival. 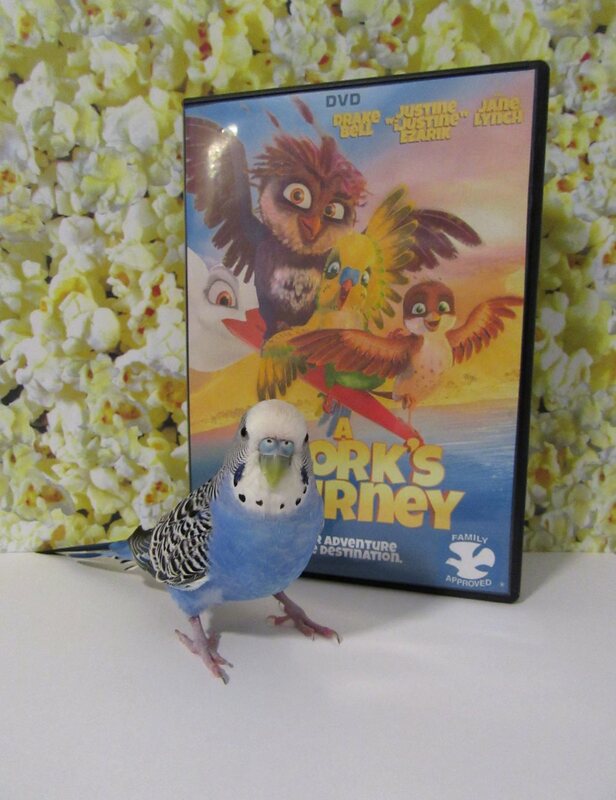 Kiki derails the trio’s journey to Africa to attend the festival, and is crushed when another budgie is singing his signature song. In the end, Kiki overcomes his fear of flying and realizes how important true friendship is. Oh, and Richard finds and is accepted by his stork family in Africa. 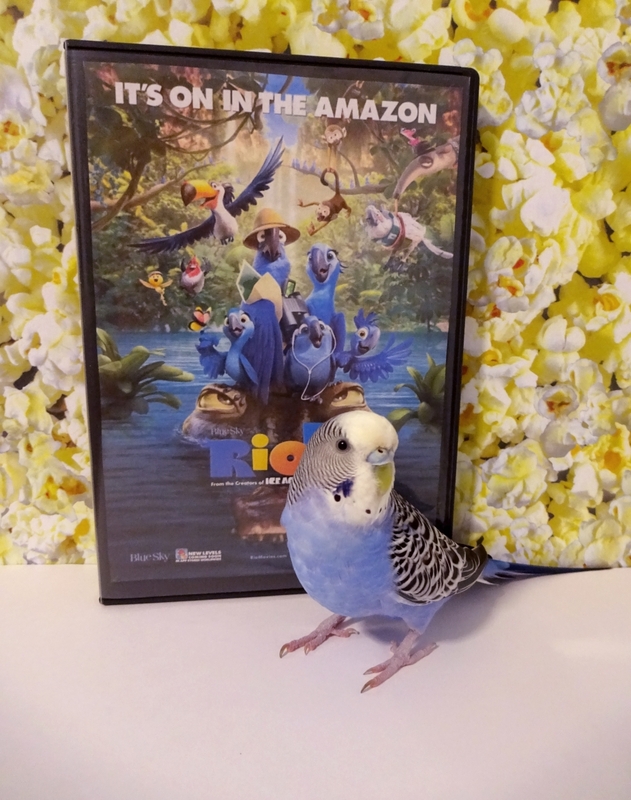 Cooper thinks this movie would have been better if Kiki had been the star. She was happy that he escaped his small cage and found true friendship. 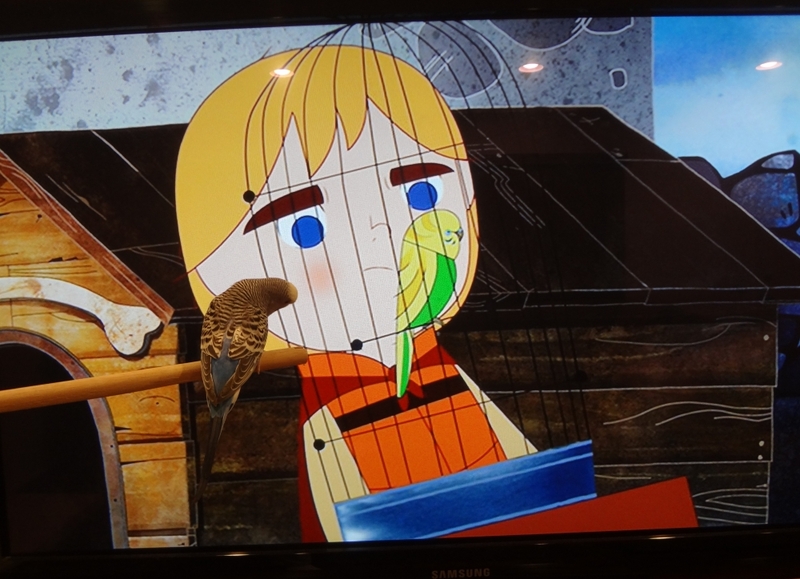 She also enjoyed seeing different bird characters (pigeons, crows), but liked the blue budgie the best. 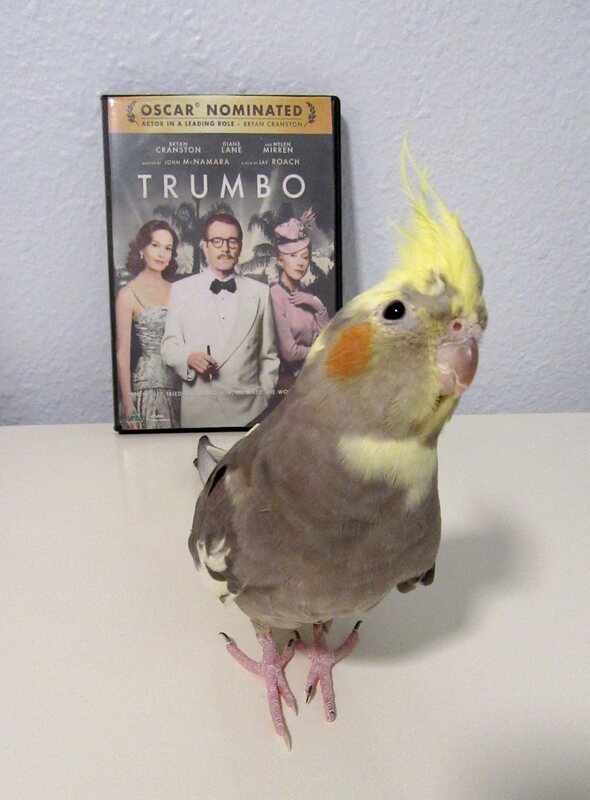 Posted on April 12, 2018 by Michelle M.
This month’s movie is Trumbo. 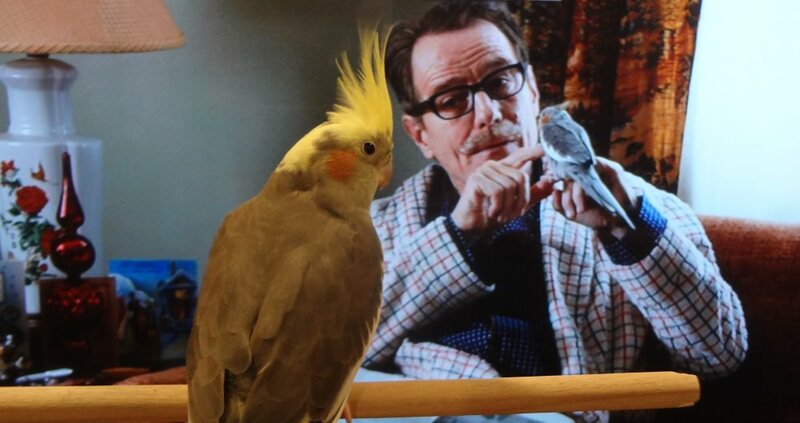 Trumbo stars Bryan Cranston, who won the Academy Award for Best Actor for this role. It follows the ups and downs in the life of screenwriter Dalton Trumbo. Dalton Trumbo is a successful screenwriter, until he and his friends are blacklisted for their political beliefs. Trumbo is sent to prison for 11 months. When he is released he is unable to find work and must resort to ghostwriting. But who cares! 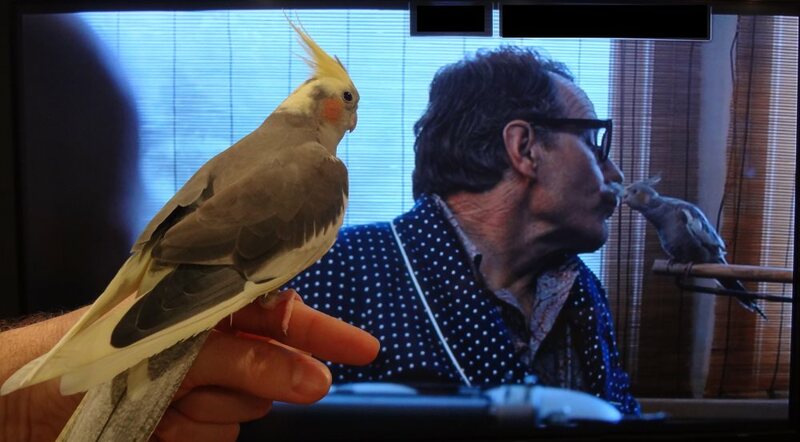 The real star of the movie is Trumbo’s cockatiel. I’m certain his pet tiel inspired him to create such works as Roman Holiday and Spartacus, films for which he was eventually recognized. 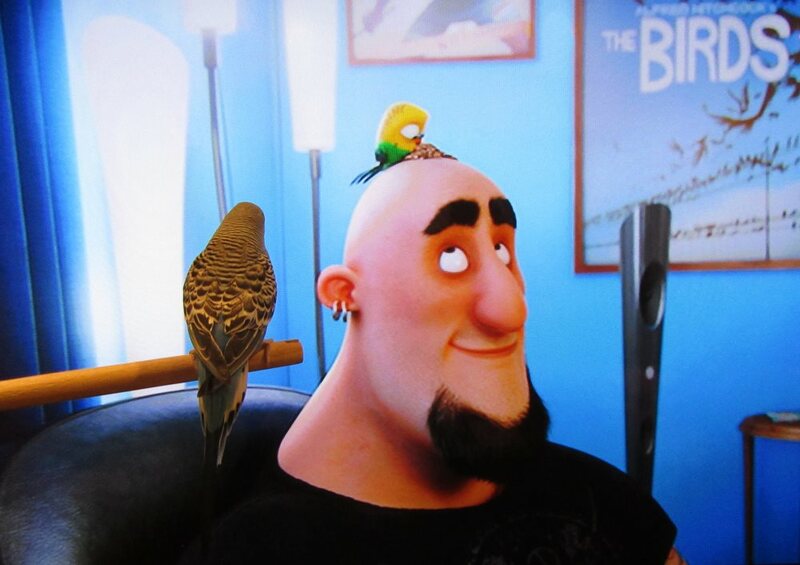 “You saw the pictures in the credits of him with the bird on his head. His daughter would find a wounded bird and he would [take it in] and then Kirk Douglas recognized that he loved birds so much, so he bought him that parrot – I think it’s a cockatoo [it’s a cockatiel]. And he named it Sam Jackson, which was the pseudonym. Sam Jackson was the name that Dalton Trumbo used to write Spartacus. Posted on October 25, 2017 by Michelle M.
This month’s movie is Stephen King’s Cat’s Eye. 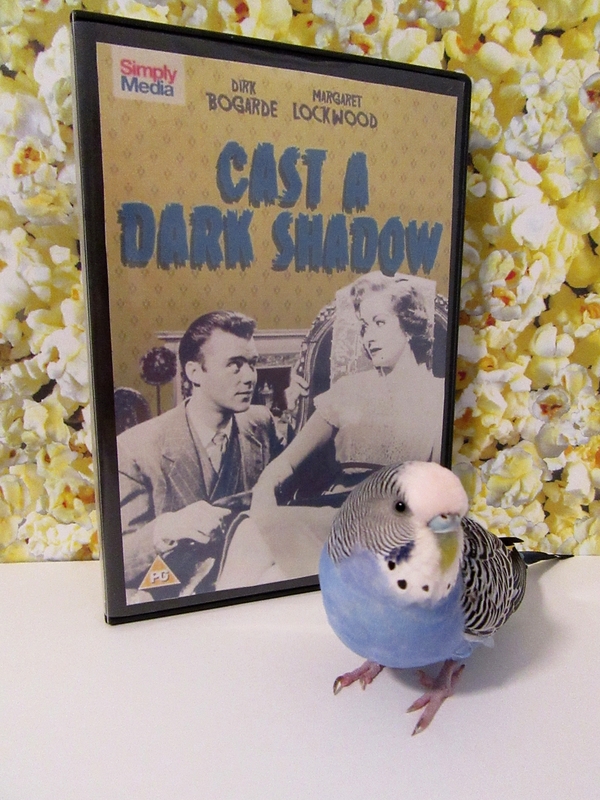 This movie is a collection of three stories, connected by a traveling cat.The first two stories (adaptations of short stories in King’s Night Shift collection) did not feature a budgie, and were of little interest to Cooper. 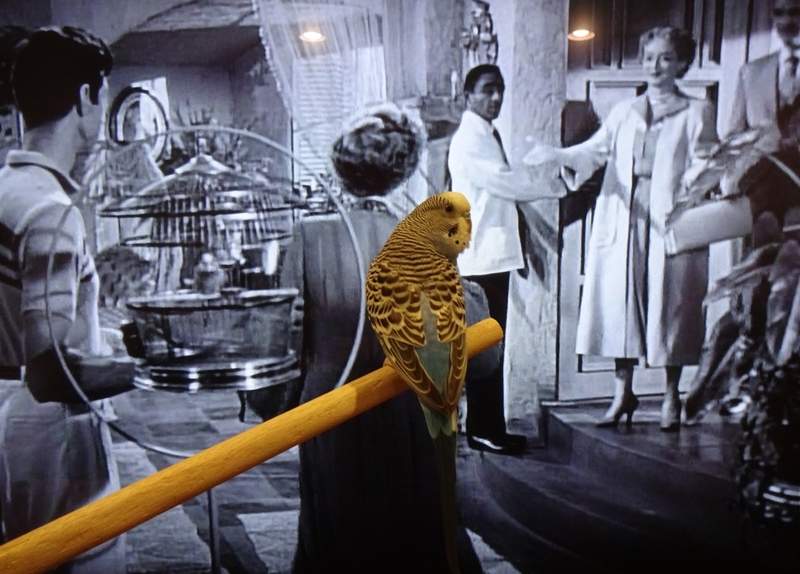 She did enjoy a pecky pigeon who was the downfall of a nasty casino owner in “The Ledge”, though. In “General” the cat must protect a little girl from a troll. 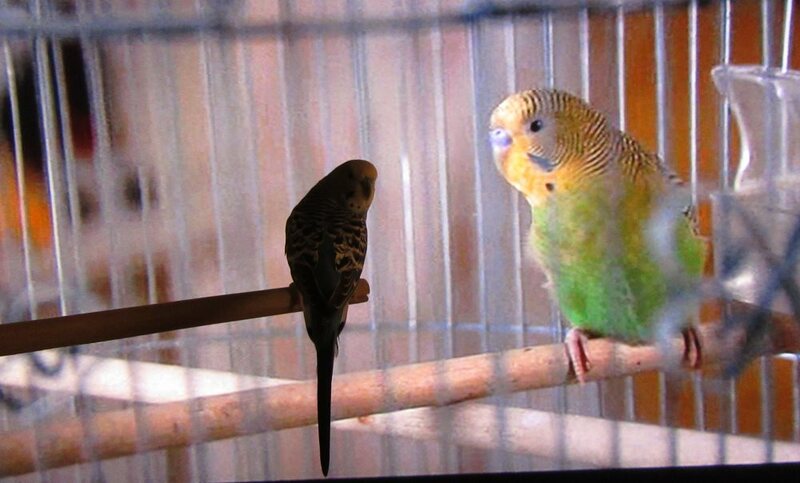 Unfortunately, General is unable to save Polly the parakeet from the evil troll. 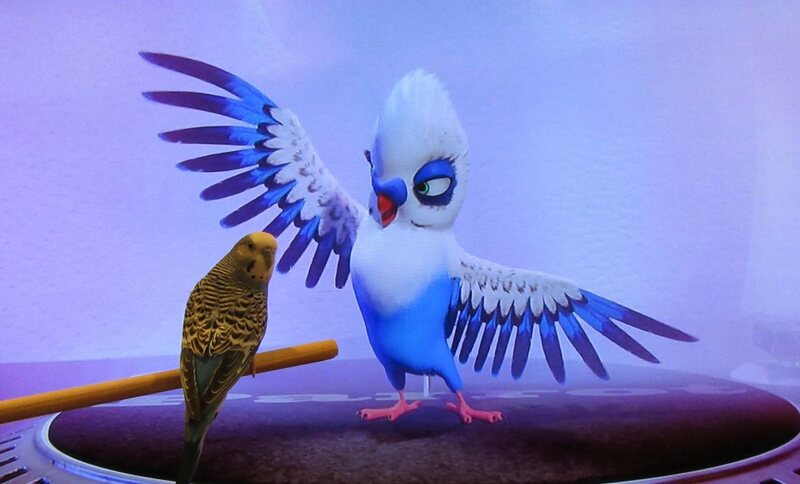 Polly’s appearance in the movie was short, but she was clearly the star of the show. Aside from Polly’s tragic demise, this is not the scariest of Halloween flicks. 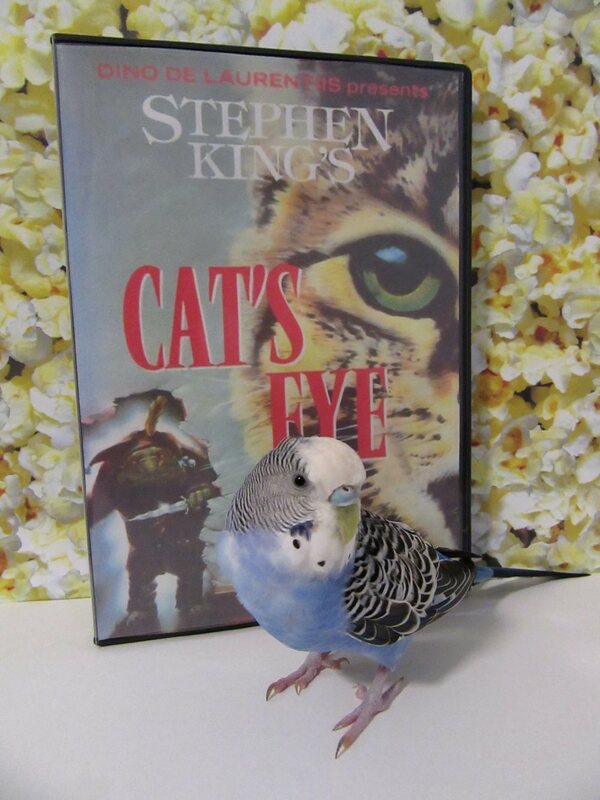 But if you’re up for a cheesy 80’s flick (look for all the Stephen King movie references), Stephen King’s Cat’s Eye is worth a look. Posted on June 9, 2017 by Michelle M.
This month’s movie is Rocky. This movie is about a small time boxer who overcomes the odds to become a champion. But who cares?! It’s all about the budgies. 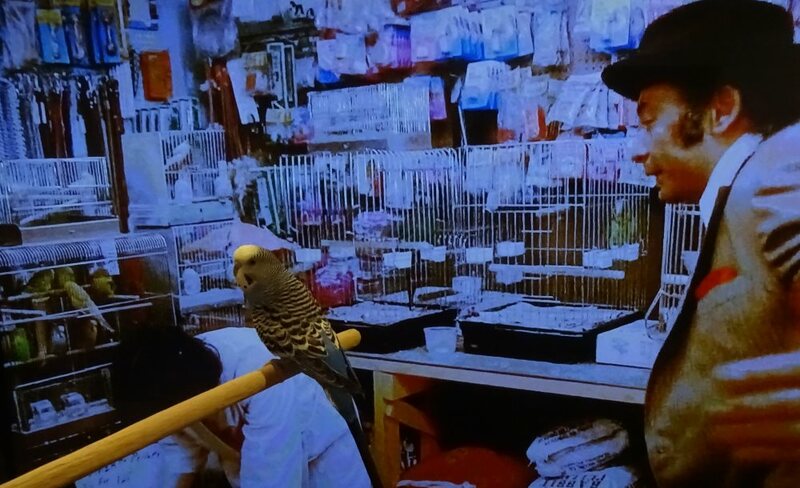 Rocky’s love interest, Adrian, is a clerk at a pet store. 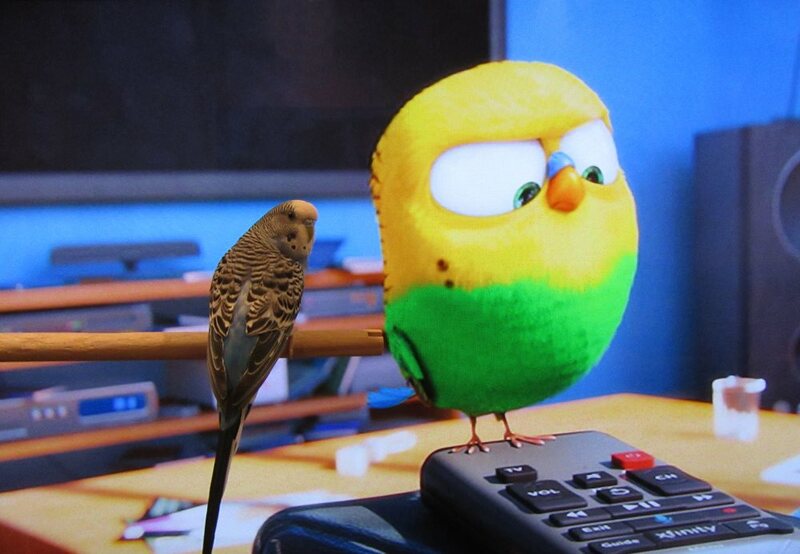 In this clip, Rocky flirts with Adrian, while the budgies (“flying candy”) steal the scene. 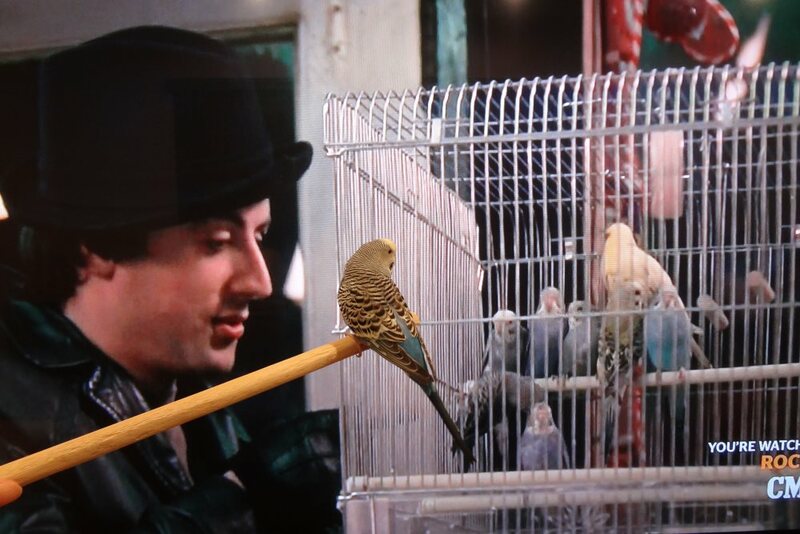 Budgies also appear in Rocky II. 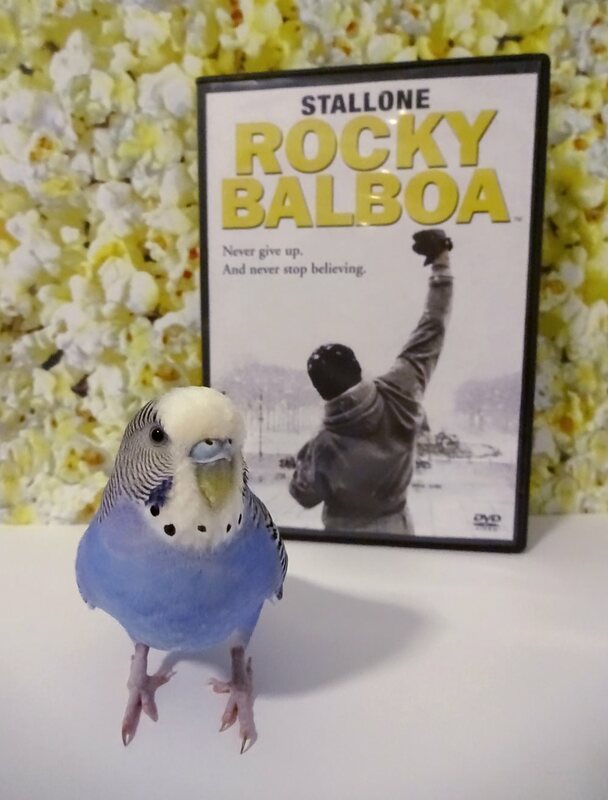 I’m sure the budgies were also the inspiration for Rocky’s theme song: Gonna Fly Now. Posted on April 25, 2017 by Michelle M.
This month’s movie is The Secret Life of Pets. In The Secret Lives of Pets, a group of pets has a wild adventure in the city while they’re owners are at work. Max, a terrier, is not too happy when his owner brings home a new dog, Duke. In his efforts to rid himself of his new housemate, the two dogs end up without their collars and are captured by animal control. With the help of fellow pets and the “flushed” pets, Max and Duke become friends and find their way back home. But who cares! 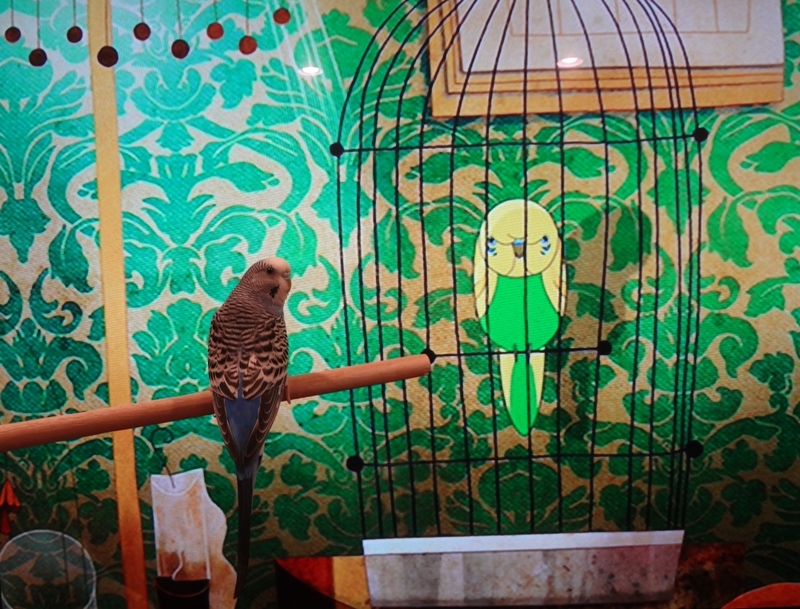 It’s all about Sweet Pea, the little green and yellow budgie. 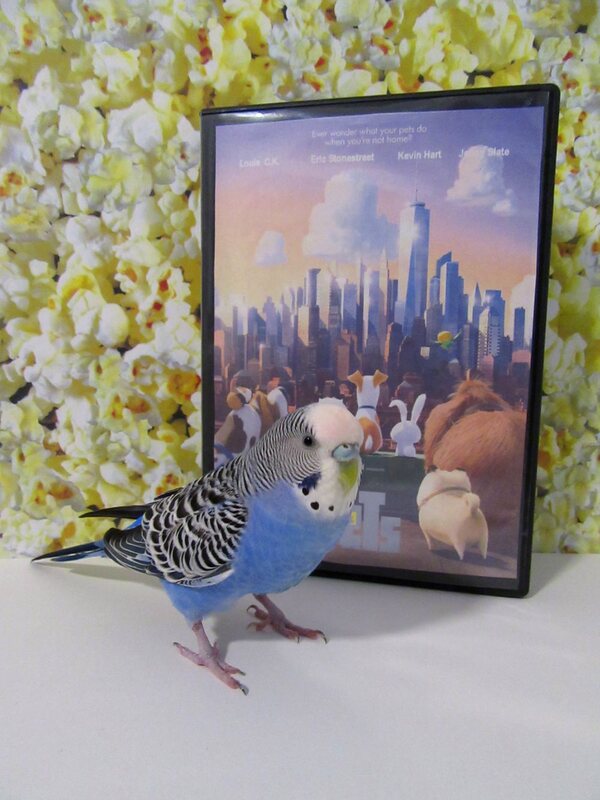 While Sweet Pea doesn’t have any dialogue (other than some chirps and tweets) and has only two featured scenes (at the beginning and the end of the movie), he lights up the screen – and leaves us wanting more. 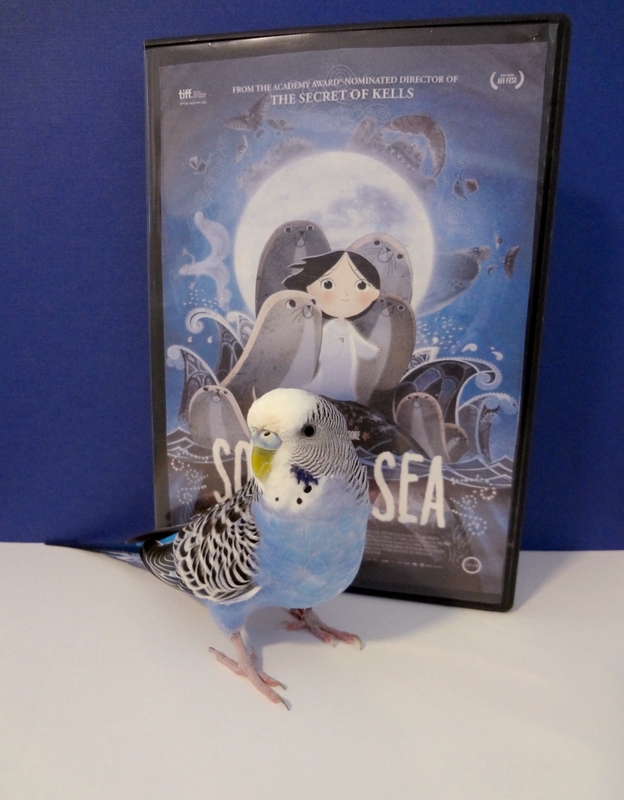 Cooper enjoyed this movie, and is hoping that Sweet Pea will have a spin-off. 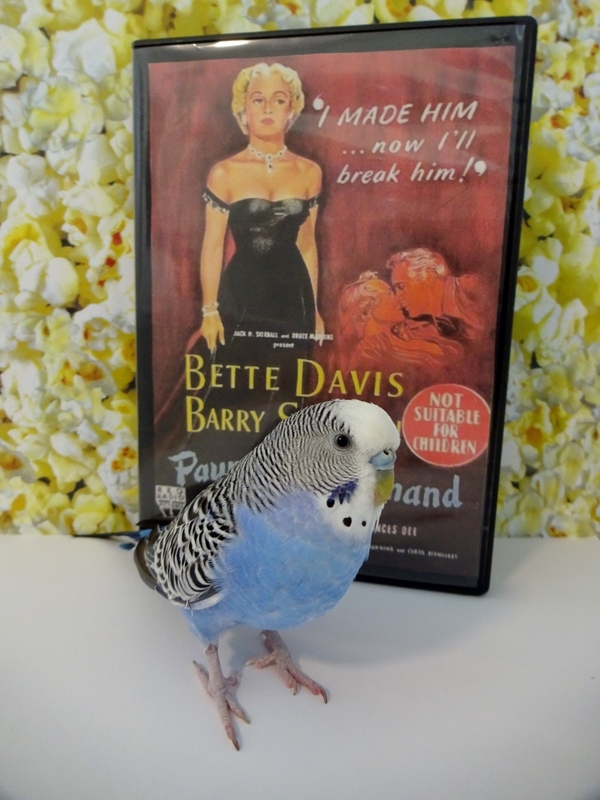 A budgie movie is long overdue! Posted on January 25, 2017 by Michelle M.
This month’s movie is Cast a Dark Shadow. Teddy Bare murders his wealthy, older wife, Monica, to gain her fortune. But his timing is off and her will does not name him as sole beneficiary. Monica’s sister is set to inherit, but lives in Jamaica, far from Teddy’s clutches. Teddy then marries wealthy Freda, who is shrewd and who keeps Teddy in check. Soon after, Charlotte arrives in town. Will Teddy be able to separate her from her money? Cooper didn’t care much for Teddy and was glad he got the ending he deserved. 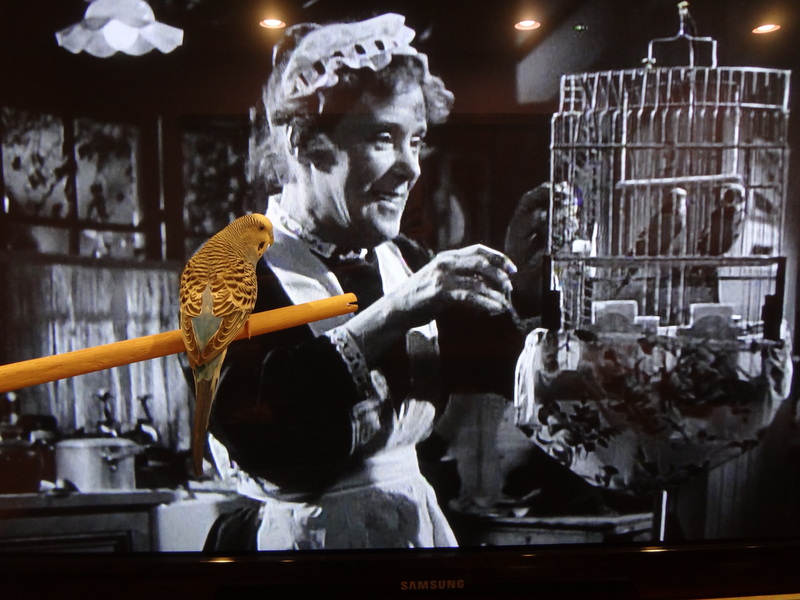 Her favorite characters in the movie were the budgies (one is named Simon) who appear in a scene with Monica’s maid. 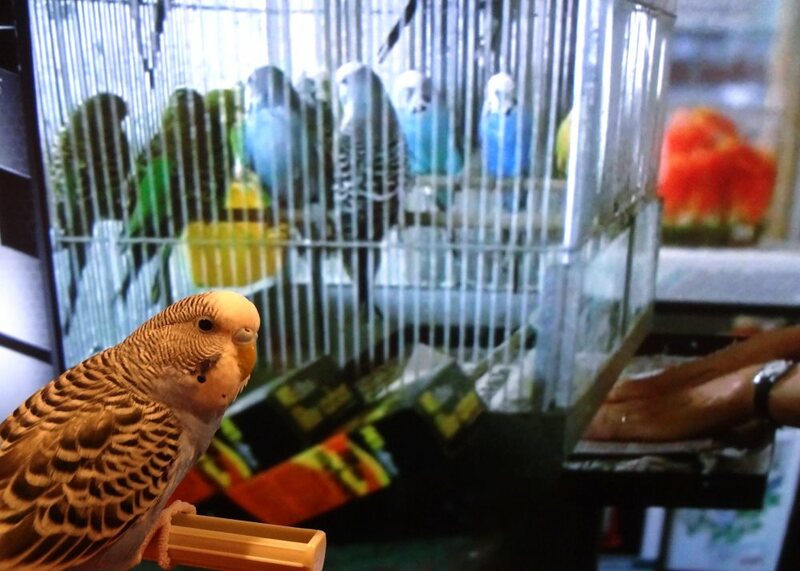 The budgies stole the show – Cooper thinks they should have been in every scene. 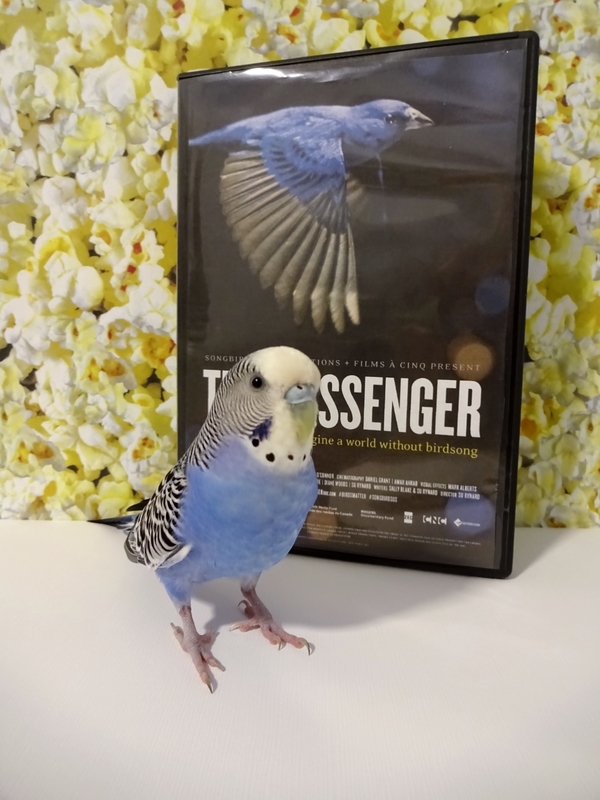 Posted on October 24, 2016 by Michelle M.
This month’s movie is The Messenger. 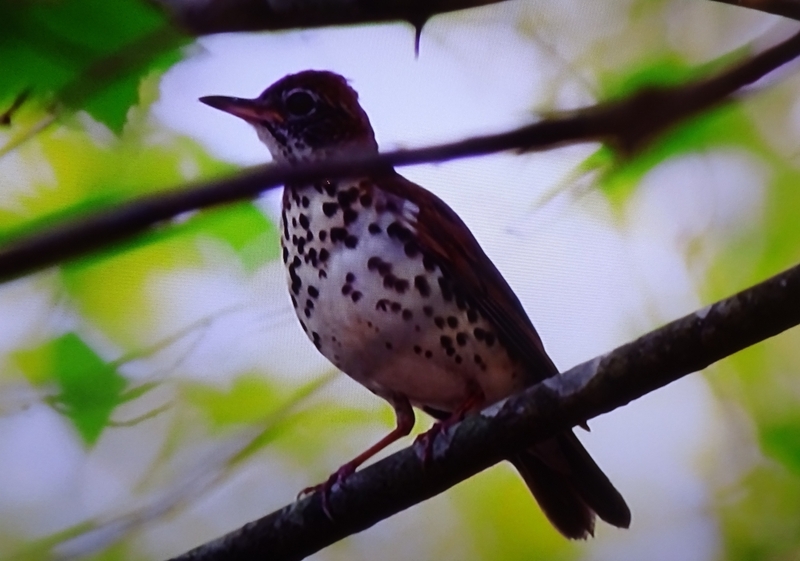 The Messenger investigates the cause and effect of the disappearance of the world’s songbirds. Global warming, predation by cats, hunting by humans, deforestation, noise and light pollution and pesticides are explored. The documentary interviews scientists and bird lovers from different parts of the world. There are some beautiful shots of various birds, both in their natural habitats and flying in slow motion. The satellite maps of migration routes are interesting as well. While there positive strides being made (Toronto activists drastically cutting collision deaths by placing markers on mirrored/clear-glass building surfaces), The Messenger is a warning that more needs to be done before it is too late. *Cooper wasn’t allowed to watch this movie, because it was too disturbing. Posted on August 18, 2016 by Michelle M.
Posted on July 27, 2016 by Michelle M.
This month’s movie is Payment on Demand. In this movie, Bette Davis stars as Joyce Ramsey, a woman whose social climbing nearly destroys her marriage. After she and her husband separate, Joyce goes on a cruise and visits her older friend Emily Hedges. After seeing the toll Emily’s divorce has taken (she is now an alcoholic living with a gigolo), Joyce decides to make amends with her husband. Cooper didn’t much care about Joyce and her marital woes. She was all about the birds who belonged to Emily Hedges. 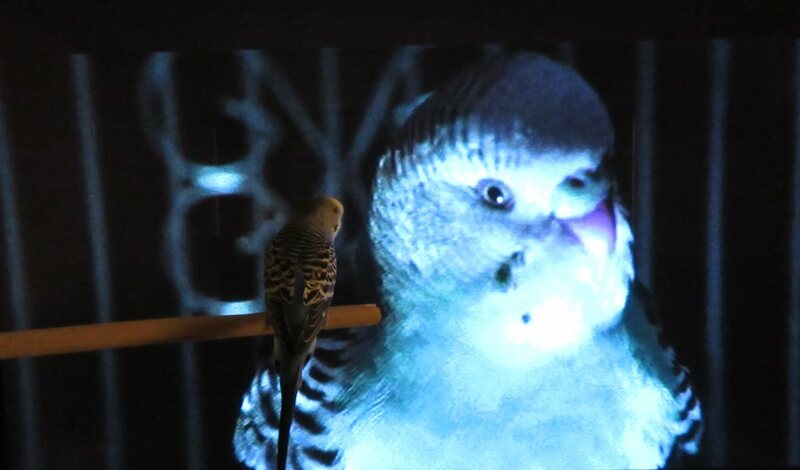 A budgie (the STAR of the film) appears briefly. 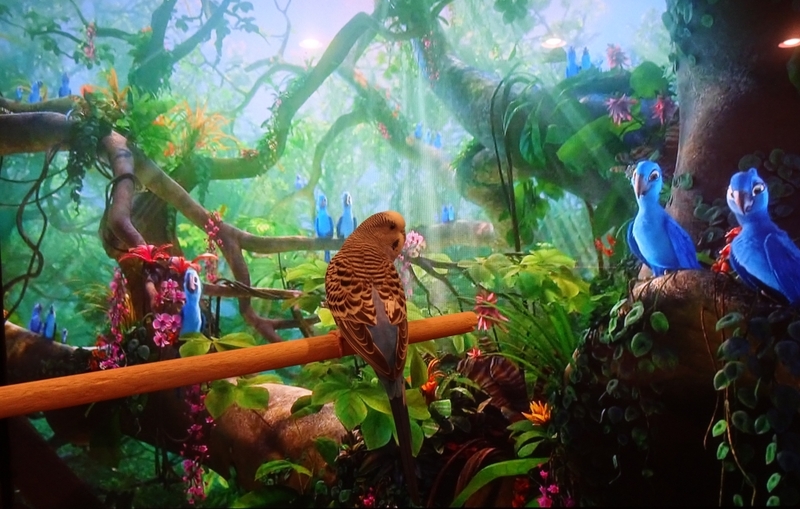 Also in the scene are a parrot and in the background is a large flight cage containing small birds. Perhaps finches, canaries or even budgies? It was too far away to tell. Cooper thought if divorce leads to an island home filled with birds, maybe Joyce should have given it a go. Posted on October 17, 2015 by Michelle M.